Comforting and soul warming food; it should be simple, tasty, makes you think of home and just makes you feel good. The food at the Soup Restaurant does just that. It is good unpretentious fare at reasonable prices. 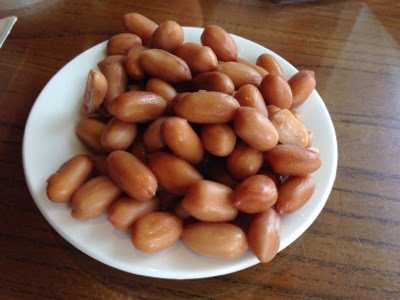 Whilst you're waiting for your meal, they also serve you some braised Peanuts. If you've never had them before; they're cooked until soft and tender and have absorbed some of the braising sauce. A nice appetiser. One of their signature dishes; and all time favourites with regulars, is the Samsui Ginger Chicken. It is wonderfully poached Chicken and because the moisture is maintained, the Meat is tender, smooth and a nice pure white colour. The highlight here though is the Ginger Sauce. The Ginger is finely minced and mixed with some Oil and seasoning. It is so tasty that you can't help but cover your Chicken in it! The Samsui Ginger Chicken also comes with Lettuce leaves so you can make it into a Wrap :) This dish is a must order and every table had a plate of it. We also fancied some Seafood this time. 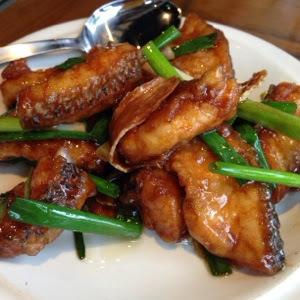 The Fried Fish Belly with Ginger and Spring Onions caught our eyes. The Fish was lightly fried and had a very nice crisp to it; whilst the outside was crispy, the flesh inside was still very moist and juicy. It was then quick stirred fried in a Wok with Ginger, Spring Onion and a sweet Sauce. The Ginger added a hint of "heatiness" to it with the nice aromatics of the Spring Onion. We really liked how fresh this dish tasted, the aromatics really made it. As Mum always said; no meal is complete without some Vegetables. We opted for some Beans with Pork Mince. The Beans were nice but a bit over cooked for our liking; it kind of wilted from too much heat, and we like some crunch to our Vegetables. The Pork Mince was interesting; it was deliberately seasoned to be more salty to contrast with the more delicate taste of the Beans. 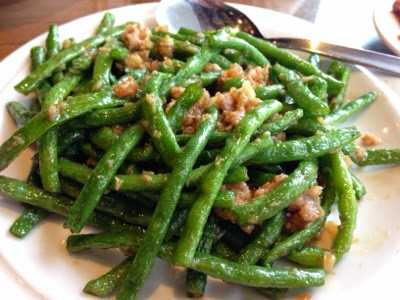 To achieve the saltiness, it was minced preserved Vegetables that was incorporated with the Pork. It was nice having the Beans and salty Pork with white Rice. It really awakens the taste buds. Where do you go when you're after that home cooked style meal? Wait so the restaurant is called soup but they don't serve soup?!! That chicken looks scary to me but otherwise sounds great! The Chicken; LOL, yeah poached isn't everyone's thing but it was good with the Ginger.